Santa Clara Valley Watercolor Society - Welcome! View the Award Winners here! View and/or download our 2019 Workshops "Year-at-a-Glance Calendar"
Note: Please check below for last-minute changes to workshop and demo schedules before you attend. 2019 workshops calendar on one page! Demos are free, and open to the public - everyone welcome! All workshops and demos are held in the Historic Hoover Theatre, 1635 Park Ave., San Jose, CA, unless otherwise noted. Time: 1:30 - 4:00 pm. Los Gatos Jewish Community Center in Los Gatos on Oka Road. NOTE: Admission to the Los Gatos Addison/Penzak Jewish Community Center requires a photo ID. You can view recent paintings on our blog. Members can post their painting to the blog as well, by following the instructions on the members only page. Former members should renew from the members only page. 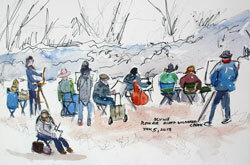 Santa Clara Valley Watercolor Society is a lively arts community based in and around the South San Francisco Bay Area. We offer a variety of art-related activities, including workshops & demos, exhibiting opportunities, plein-air painting, and other special events for members and the general public. Read more about SCVWS Join Us! Become a fan on Facebook!